From the Murphy Rec Center in Philadelphia, Pa. to Sam’s Town in Las Vegas, NV., Ring Of Honor has undergone plenty in its 15-year history. It was only appropriate that the face of the “old times” that hadn’t gone to World Wrestling Entertainment, Christopher Daniels, would get his last chance at the ROH World Championship, a belt that alluded him his whole career. It was also right that the current Champion was Adam Cole, Bullet Club leader, which represented the “new school” ways of ROH. Of course this show will be regarded as “the one where TK O’Ryan got hurt,” but there was plenty of happiness to go around the card as well. – The Punishment Damien Martinez/BJ Whitmer-War Machine match carried off past quarrels where a match went to the wayside for the purpose of pointless brawling. At least it gives the four something to do, as Martinez’s future’s the most to gain here. It also helped this episode that Colt Cabana was on commentary in classic boastful heel mode. We also liked the little touch that WM wore face paint. It adds to their look, albeit in a “Braveheart” way. Whitmer seems to get “go away heat” and that continued here as not much action occurred. There was a moment where Hanson performed a spot where he repetitively ran his opponents in the corner, to the point the fans did the rally cries with him. It lasted about a minute, legitimately. There were some consistent double-teams on both ends, including an impressive pop-up powerslam by WM. The finish is where things get silly again, because the four men are so into the brawl, the damn 20-count passes them right by. Countouts in ROH are just ridiculous. The only solace taken here was that Martinez/Hanson could make an intriguing singles match one day. Let’s hope they go that route. – With Wrestle Kingdom 11 on the back burner (though it aired on Jan. 4 and they’re just giving us the Ring Of Honor followup now), we had a new ROH World Champion and his name was Adam Cole… bay bay. The opening video looked back at Cole’s match with Kyle O’Reilly at WK11 and had him cut a promo over match footage about how “he” effectively concluded the story. Finally, some updated stuff. We were spinning our wheels there. – Christopher Daniels’ hype video promo did a good job of showing his refocused goal of his “destiny to become Champion” in the midst of the Decade Of Excellence Tournament that he was a part of. He defeated Mark Briscoe last week to advance to the second round. He spoke about how he made a name for himself in 2002 and they wisely played back footage of those classic Murphy Rec Center days when he denied handshakes and broke the mold as the face of The Prophecy, despite never holding the ROH World Championship. They flashed back to now, to where he gives those handshakes and obeys the Code Of Honor, a presumed changed man. With this kind of package, we could tell this next push was set to be a serious one. It also helps to get more passionate promos like this one, because that’s what Daniels does best these days. Photo courtesy of Ring Of Honor. 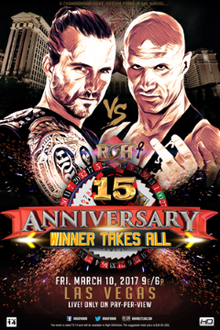 Despite the adage, what happened in Vegas didn’t stay in Vegas, since Ring Of Honor held its 14th Anniversary Show live on Pay-Per-View and stars from New Japan Pro-Wrestling were also here for the party at Sam’s Town. An underwhelming undercard was made up for by a better second half, fronted by the triple-threat for the ROH World Championship between Champion Jay Lethal, Kyle O’Reilly and Adam Cole and an insane six-man tag. – The opening match between The Addiction and ACH/Alex Shelley was entertaining in the way of seeing the former Motor City Machine Guns interact yet never get physical and for ACH’s athleticism, which often speaks for itself. The finish was okay, with Chris Sabin helping his buddies win by distracting the Referee. The post-match angle was quite telling in how Sabin looked conflicted when Addiction beat down Shelley, but never saved him. We liked the way Christopher Daniels drew big heat by attacking Paul Turner after grabbing the ringside hammer, threatening to use it. The only logical way to come out of it was with Matchmaker Nigel McGuinness suspending Daniels, a consequence regarding the company’s “zero tolerance” policy. With Daniels out of the picture, where does that leave Frankie Kazarian and Sabin? We want to see where it goes, as long as it ends up with MCMG back together, which is seemingly what everyone wants. 2015 ROH boasts competitive matches plenty, a fierce Tag Team division, logical storylines and above all else, ROH World Champion Jay Lethal arguably in the prime of his career. This edition of Final Battle delivered on the hype, even if it was more about being predictable to set up storylines for the new year than creating true moments to drop our jaws. In this case, it doesn’t hurt to be predictable. 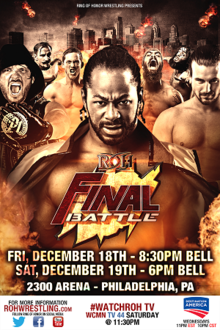 – With Dec. 18’s Final Battle Pay-Per-View fast approaching, ROH dedicated numerous segments to push the year’s biggest show. The Silas Young/Beer City Bruiser-reDRagon match was a solid opener, which allowed the Young-Dalton Castle feud to continue with a new wrinkle of The Boys being loyal to their new boss, while Adam Cole smugly worked his way to commentary mid-match to rip on Kyle O’Reilly, calling him lazy, undeserving of his success and was jealous of the idea that he was on the same level as him. The in-ring action was entertaining with back-and-forth swings and again, BCB took big bumps for someone his stature and reDRagon had some great double-team maneuvers. reDRagon winning made sense in the way that it kept O’Reilly strong and then their feud was covered after the bell when they nearly came to blows. Also liked the post-match interaction between Young and Castle in showing The Boys’ sticking with Young, even though they teased going back with Castle. There’ll be another match at Final battle and it’ll be interesting to see if The Boys are thrown in there. Solid storytelling all around. “Notes In Observance” features random thoughts and analysis on recent television. Quick results can be found at the bottom of the post. – For what it’s worth, the Silas Young-Boys cold opener of him forcing them to do “manly” things like changing a car tire and using “manitizer” (aka spitting into your hands and rubbing them together) was worth a good laugh. This was some of the stuff we imagined the moment Young won their “service” at All-Star Extravaganza VII.